The Milwaukee® 12 piece Sawzall® blade set features an assortment of our most popular demolition blades for a broad range of professional applications. 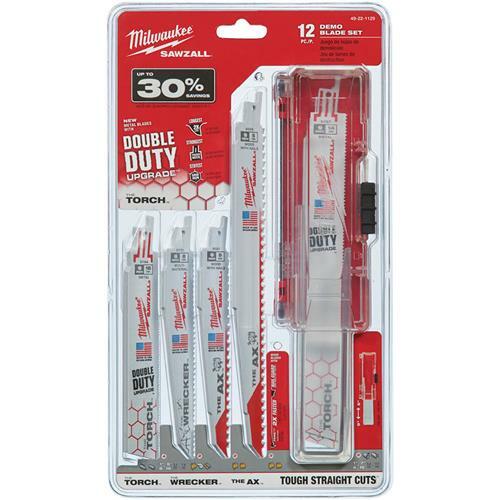 Milwaukee demolition blades are thicker for maximum durability and taller for straighter cuts. The set features The Ax™ for cutting nail embedded wood, The Wrecker™ for general purpose demolition cutting, and The Torch™ for metal cutting. 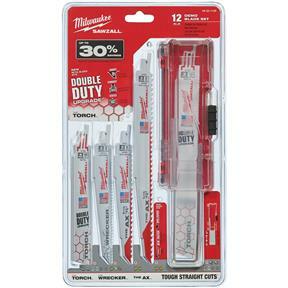 The set also includes an innovative job site durable case for convenient blade storage.